Bays and black horses photogrpahed on the central plateau, North Island. ~ during the early 1970s. 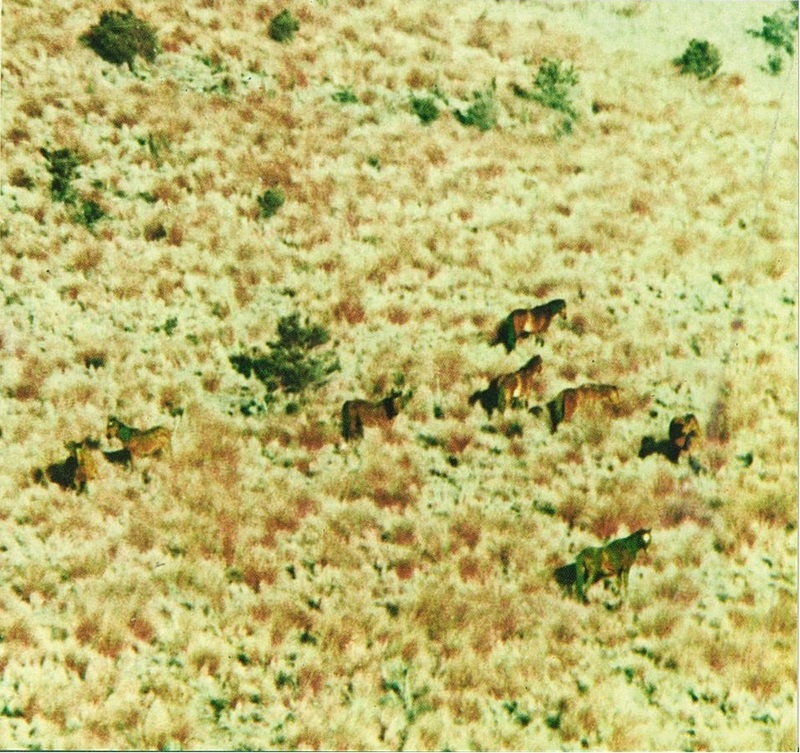 Source: Morrow (1975) New Zealand Wild Horses. Millwood Press. 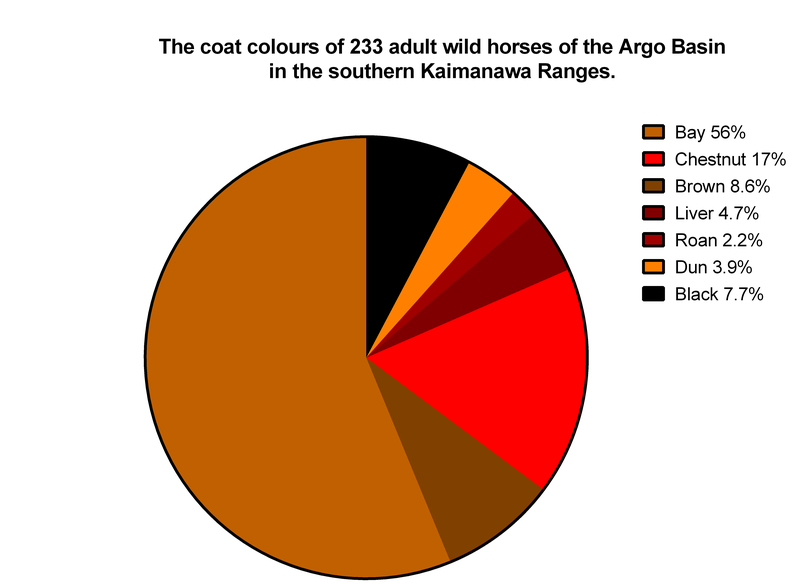 The coat colour variation described by Harvey Morrow  in feral horses of central North Island during and around the 1920s is not evident in today’s Kaimanawa horses. The colour illustrations of Kaimanawa horses in his early 1970s book also look to have todays more limited palate. But Morrow’s photographs of the remnant but now extinct Roto Aira population around National Park just 35 kilometers from where the Kaimanawa population roams today shows a Tabiano pony behind two chestnuts and a bay (see photograph below). Have alleles for pattern and hue been lost or were they never present in the Kaimanawa herd? Any of the few more colourful horses might have been taken from the population, being more attractive to the musterer’s eye. Harvey Morrow indicates as much – horses with unique coats were favoured for capture. The steel-grey mare was still on her own when we made our usual survey from Wild Horse Lookout next morning. […] Her capture was only a matter of minutes. Chapter 7 – The Steel-grey Mare. Not long after the return of the grey mare to the run a new mare appeared. […] She was roan in colour and in due course produced a lovely roan colt. […] Her colt developed into a very attractive animal. … we did covet the colt. Chapter 8 – The Roan Colt. The large musters from the Kaimanawa population during the 1950s and 60s for pet food too might have culled colour from the population. It is more likely, however, that alleles for hue and pattern were never bred into Kaimanawa horses. 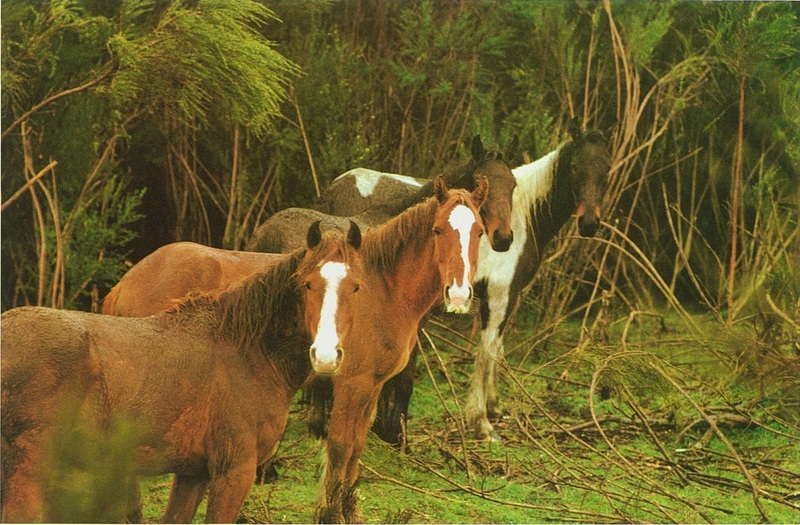 Four feral horses around National Park ~early 1970s from Morrow (1975) New Zealand Wildlife Horses. Millwood Press. The domestic origins of the Kaimanawa population are not as diverse as those that no longer exist in other parts of New Zealand. The Kaimanawa population are most recently descended from the release of cattle and sheep station (farm) and cavalry (military) horses that were less likely to be bred for brighter, patterned colours. Genetic studies confirm that Kaimanawa horses are most similar to thoroughbreds and thoroughbred crosses that made up most of the military and hill-country farm horses of the early 20th century . Some surmise the genetic influence also of the Carlyon and Comet ponies in the Kaimanwa population today – ponies bred during the late-19th century for the demanding conditions of colonial New Zealand. And, the Carlyon and Comet were not colourful breeds either, being descended from imported Exmoor and Welsh stock renowned for their plain ‘browness’. Such ‘brown’ horses are certainly not a genetic type but chestnuts or, less often, bays whose coat colour is much darker than is typical but it is not possible, without genetic testing, to know which. Indeed, indecipherable brown coat colours amongst the Kaimanawa horses, where they made up almost 10% of our studied population, might be attributed to this early English and Welsh genetic stock. The Kaimanawa horse, is seems, is classically plain – its genome being largely dominated by black and chestnut alleles and bereft of alleles for hue and pattern. And so it seems Harvey Morrow’s colourful wild horses and their descendants didn’t make it to the Kaimanawa Mountains or, if a few did, they didn’t elude capture or muster. Instead, the stoic, pragmatic choice for browness by first-colonists and then by cavalry and hard-country farmers, colours the Kaimanawa horse of today. Nevertheless, over the four years that would follow seeing my first Kaimanawa horse, we would adapt descriptions of coat colour as part of our horse identikit and make the most of what variation there was. We developed detailed, sometimes unorthodox, descriptions of a horse’s pelage, especially amongst new foals to the study and unbranded horses. Sometimes descriptions of variations in the darkness of ‘brown’ across a horse’s body proved valuable. We recorded lighter, darker, chocolate and black browns. Some had lighter brown muzzles, breasts and barrels. Looking closer now and for longer at my first band on that cool, clear August day in 1994, I began to differentiate amongst Kaimanawa colours. The mare was lighter than her foal – what I might describe now as a yellow chestnut with flaxen (bleached) mane and tail. Another mare was bay and the stallion was so dark as to probably be black. More brown than most they may be, but I would learn to see individuals and discover the colourful lives of Kaimanawa horses. I wanted to know about coat colour genetics and inheritance in the horse because Kaimanawa Horses are so plainly brown – much more so than historical accounts of wild horse colours that included grey, roan, blue, piebald and skewbald. As it turns out compared to other animals, horse coat colour is a fairly simple genetic problem. Although selective breeding can produce incredibly diverse coat colours in horses, white, grey, black, red (chestnut) and bay horses are the basic colour types . Which basic type a horse is-is governed by just four genes, each with their own site, called a locus, in the horse’s genome. There is one gene and locus each for white and grey horses, and two others determine the chestnut, bay and black hues. Four genes can produce five different basic colours because each gene for coat colour has two different forms, called alleles. The allele at each loci can be either dominant or recessive. A recessive allele’s influence on coat colour is weakened or prevented entirely if there is a dominant allele at one of the other three loci. 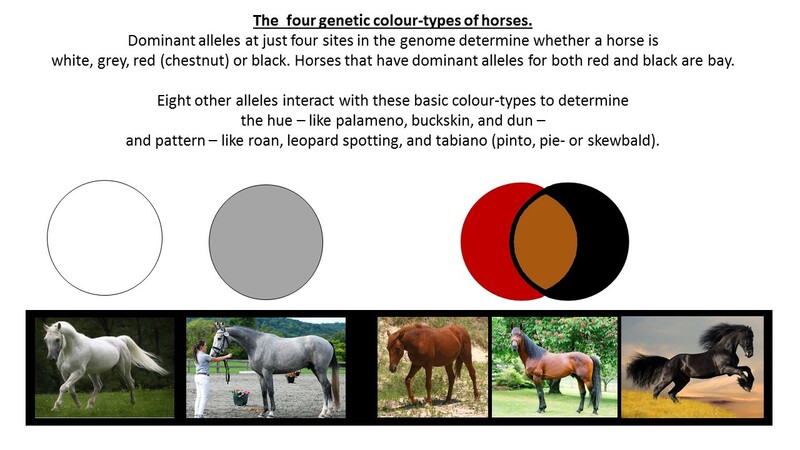 And so different combinations of dominant and recessive alleles at the four loci determine the coat colour of a horse. Crudely put, dominant alleles rule such that horses are black or chestnut if they are not white or grey. Dominant alleles at loci for white or grey make white and grey horses. A horse is black because it has a dominant allele at the loci for blackness but does not have a dominant red allele at its loci for redness. Chestnut horses do not have a dominant black allele, and so the red colour is uninhibited. Bay horses are an interesting combination of the two. They have a dominant allele at both the loci for redness and blackness, causing much of the black hue to be restricted to their extremities – mane, tail and feet. After those four loci for the basic colour types, four other subordinate loci on the genome govern the different hues of black, bay and chestnut, such as palameno, buckskin, and dun. And another four loci govern coat colour patterns, like roan, leopard spotting, and tabiano (pinto, pie- or skewbald). But alleles at these eight loci for hue and pattern have no influence if the alleles for black and red are not also present. Different shades and patterns, therefore, are variations of fundamentally black, bay or chestnut horses. Knowing how horse coat colour is derived and inherited, we can turn back to the question why are Kaimanawa Horses to plain brown? Perhaps they are not afterall? – my next post. Thiruvenkadan AK, Kandasamy N, Panneerselvam S. 2008. Coat colour inheritance in horses. Livestock Science 117: 109-129. The cold wind, in waves from across Mount Ruapehu, has washed the sky of its blue. High and thin, ice-grey cloud has been super-smoothed from horizon to horizon. A balaclava frames my view of the range above and the basin below. Turning my head slowly and methodically – scanning left to right, top to bottom – I search the patchwork brown land. Distant brown horses – Kaimanwa horse band near Waiouru township and army base. Source: David Pike, reproduced from Morrow 1975 . In the clean, clear air a first attempt to stand by a shaggy brown foal, although four kilometres distant amongst similarly brown manuka scrub, focusses me suddenly. And from that small, distant movement an entire band is gradually revealed. The foal gambles down-slope like its legs are still waking up. First, the foal leads me to its mother. Then others, spread around them across the hillside, are unveiled. ‘Dumped’ in the middle of the southern Kaimanawa Ranges, I had the vague expectation that the Argo Basin before me would serve as the central study area for my research. I was part of a team contracted to trial a new contraceptive for managing the population. The trial would require that I know horses’ living, breeding and dying, how they use the landscape, and their relationships with each other. And to grow this data, I first needed to reliably identify each horse. I wasn’t, however, even slightly équestre – a ‘horsey person’. I didn’t ride, I still don’t. I’d never owned a horse, although my two younger sisters had childhood ponies. I didn’t know a whither from a fetlock or, for that matter, a bay from a chestnut. To my untrained eye, my first band of horses on that distant slope, all looked, well …, brown. But I knew coat colour variation could be a useful tool in a horse identikit. Domestic horse breeds vary incredibly in colour. And when they rewild – escape or are released to form free-ranging herds – their cross-bred descendants carry and mix that variation. The colour variation and patterns, then, become the unique marks of individuals, even more so than in most other wild animals. Wild North American herds, particularly, are a beginning researcher’s dream, being a melting pot of many nations’ idiosyncratic breed preferences. The 18th and 19th century Spanish, British and French contributed an enormous variety of domestic stock to the continent’s wild herds. My first impressions, however, on that cool, clear August day in 1994 was that Kaimanwa horses were not nearly as variable. But New Zealand’s wild horses have not always been so lacking of coat colour and pattern. Harvey Morrow described an enormous variety of feral horse stock in the early 20th century . Black, chestnut, grey, roan, blue and piebald (pinto black and white) coats are mentioned. Tony Batley too, in his research and writing about wild horses of the central North Island, reported horses captured from the Kaingaroa Plains being iron grey . And New Zealand’s indigenous people, the Maori, who rapidly adopted and adapted the horse after its introduction and cultivated wild herds, were reported to have a preference for piebalds and skewbalds . What happened to all this variation? Why are the Kaimanawa horses of today not like those more colourful in North America? To answer that question I should first find out about the genetics of coat colour and how it is inherited in horses – my next post. Morrow H. 1975. New Zealand Wild Horses: Millwood Press. Batley, RAL. 1977. Wild horses of the south-west Kaimanawa Range. Unpublished manuscript. Mincham, CJ. 2008. A Social and Cultural History of the New Zealand Horse. Ph.D. Thesis, Massey University. The central North Island of the 1800s and early 1900s was a remote, difficult and inhospitable terrain. It was the place where New Zealand’s first-nation peoples, the Maori, maintained ownership and sovereignty of their lands to the greatest extent despite the European onslaught. 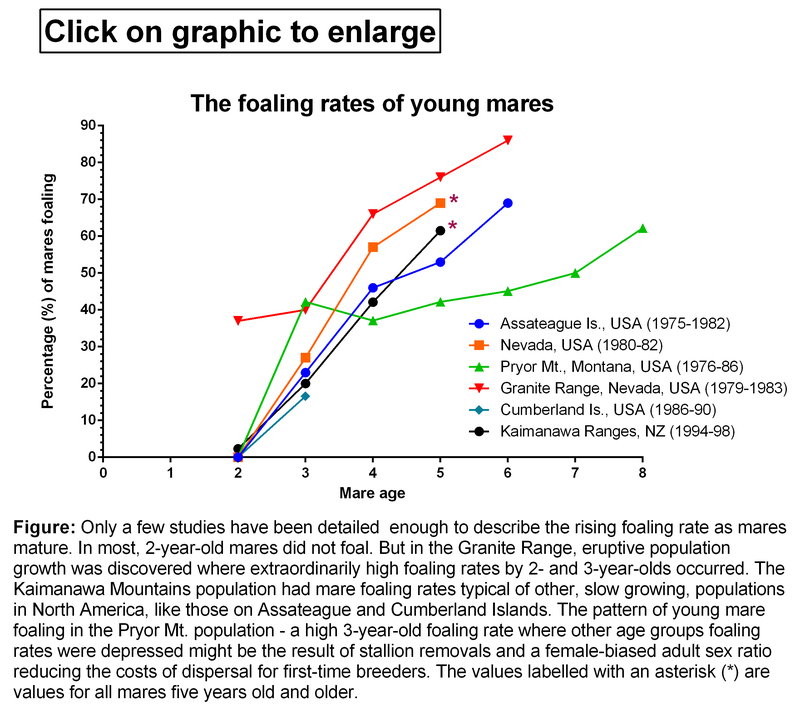 But populations of feral horses, sometimes numbering in their thousands, became common through the region for most of the late-19th century and persisted during the first half of the 20th. The earliest report of free-roaming horses in New Zealand is in the diary of Mr R. T. Batley in the upper catchment of the Moawhango River, 15th March 1876, on the high volcanic plateau of the central North Island , but they were certainly present at, and before, this time in other parts of the central North Island too. Indeed, as early as 1857 owned horses were widespread amongst North Island Maori . Reportedly the Mataatua and Tûwharetoa tribes of the Bay of Plenty, Rotorua and Taupo Districts owned almost 2000 . And so horses colonised much of the landscape before farms and Europeans did. Some were escapes and releases from Maori communities, and migrants travelling through. Later, farms and the small towns – many of which no longer exist – along remote North Island roads provided sources of feral stock. Many horses were just turned out, especially old horses and those not useful because they had become lame or unreliable, but also mares with foals, and young horses such as yearlings and 2-year-olds  – sometimes with the expectation that they, or their offspring, might be captured later. Maori developed relationships with domestic and free-ranging horses similarly to North America’s first-nation people. The new European colony’s requirement too for horses was sporadic in ways that grew free-ranging populations. Mounted constabulary teams formed temporarily, for example, captured and then released horses when constables returned to their ordinary lives. In these ways populations of feral horses were founded, cultivated and grew. The populations, some of just a few horses but others with thousands, varied in their feralisation and wildness. Some met with very few people – being in remote and difficult country. Others lived a somewhat connected existence with their liberators and might be regarded as semi-feral. Farmers re-caught wild-bred horses for use on farms and released others. Mustered horses were also used to graze out the grasses from rough pasture that were less palatable to sheep and cattle, like chewings fescue (Festuca rubra) and toetoe (Austroderia spp.) . An economy grew around horse capture for use on farms and sale for slaughter. Large numbers of horses were mustered, especially where they were abundant and the topography allowed it. Some efforts to capture and provide them for sale where they might reach best price were extraordinary. Horses caught around Atiamuri in the 1890s were driven to Fielding and Palmerston North over central North Island’s imposing country for sale – 140 miles as the crow flies before there were roads . Those events are probably reported because they were amongst the farthest wild horses were driven but they provide an understanding of the motivation and extent of the industry. The last feral horses were mustered and sold in Fielding and Palmerston North during the 1930s. On a smaller scale many caught horses for their own purposes or sale locally – being more selective – and so a cottage industry developed around horse capture and it is this small industry that Harvey Morrow (1975, Millwood Press) describes. Harvey Morrow lived, worked and chased wild horses in the upper central North Island during the early part of the 20th century, beginning during the first World War. Living in Pairere in Hinuera Valley, he and friends rode 25 miles southwest to the Waikato River, up river past the Hora Hora Power Station (now submerged below Karapiro Power Sation Dam), on to Arapuni around which wild horses roamed. 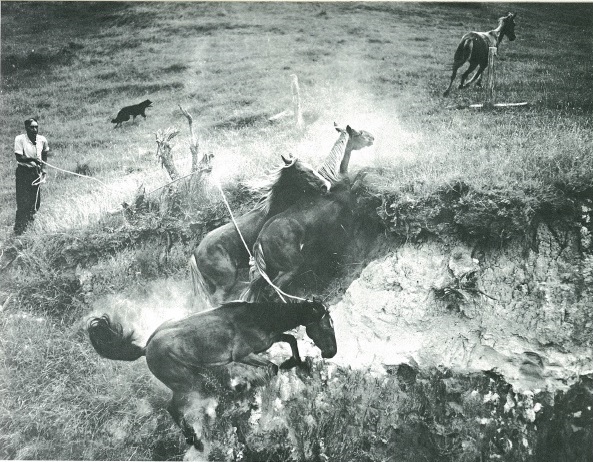 Morrow  describes catching horses with wire (No 8) snares suspended across worn animal trails that wound through scrub. Wild horse capture. “Wild horses in the process of a hunt at Maraenui, East Coats, Auckland. According to information at the Turnbull Library, Maoris trapped wild horses in a cutting on the Maraenui Road” – from Morrow (1975) Wild Horses New Zealand. The horses were caught by the neck as they fled from chasers on horseback. The snare would be tied to an anchor, like a small bush or tree that might uproot and drag when the horse was snared to absorb ‘gently’ the impact of the horse at full gait. A second, more robust, anchor was sometimes tied to the first to guarantee capture. Riders would chase to direct the fleeing horse along the booby-trapped trail and even so close as to grab and pull sideways its tail to unbalance it – like cow tipping, but at speed. Dismounting and quickly sitting on the grounded horses neck secured it while it was roped to a riders mount for the journey home. Morrow called horse capture ‘sport’ and described the techniques used as only rarely injuring a horse. For the modern-day reader and horse enthusiast, especially those who have watched a horse at full gait trip, fall, and cartwheel, to somersault into a slide, head and neck prone, along the ground or seen a horse cut on wire fences, the image of tripping and capturing horses in a wire neck snare will probably be about as far from sport as they could imagine. Our expectations about the treatment and welfare of horses have, mostly I think, changed very much. Mincham, C.J. (2008) A Social and Cultural History of the New Zealand Horse. Ph.D. thesis, Massey University, Albany. 316 pp. Mitchell, P. (2015) Horse Nations: The Worldwide Impact of the Horse on Indigenous Societies Post-1492. Oxford University Press. 444 pp. Beginning with his first chase aged 15 in 1915, Harvey Morrow caught his first wild horse in the winter of 1916 around Arapuni in the Waikato. He wrote a small book, New Zealand Wild Horses (1975, Millwood Press), describing his experiences catching horses. Within his anecdotes and stories is a rich vein of information about the distribution of herds of feral, free-ranging horses during the latter part of the 19th and first half of the 20th century. As well as the places he hunted, Morrow mentions, in passing, many other places where herds of wild horses roamed and were chased for sport or mustered for sale. 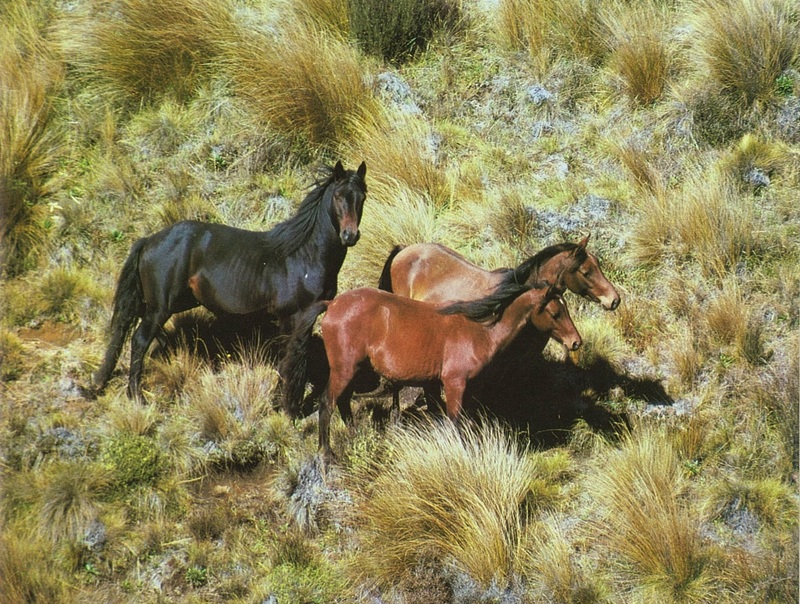 Wild horses, it seems, were common wherever there was deforested, less developed ‘rough’ land between working farms and remnant forest, especially in the foothills and mountains of the central North Island. Morrow mentions the earliest written reports of free-roaming horses are in the diary of Mr R. T. Batley who described track and sign in the headwaters of the Maowhango River on 15th March 1876. But horses were certainly present before this time in other places in North Island – releases and escapes from Maori and migrant, travelling European colonists. Places at, or around, which herds of free-ranging horses and horse captures are reported in Harvey Morrow’s 1975 book – New Zealand Wild Horses (Millwood Press). I include a date where that information was also mentioned. Herds were common wherever there was deforested, less developed ‘rough’ land between working farms and remnant forest, especially in the foothills and mountains of the central North Island. If you have oral or written histories about wild horses in New Zealand you can send me the years and places for adding to the map to my e-mail address: wayne.linklater@vuw.ac.nz. Notable herds of horses are recorded on the Rangitaiki Plans, 36 miles to the northeast of the Moawhango headwaters, and around Waiouru, 18 miles southwest, in the last 5 years of the 19th century. On the west side of the volcanic peaks of Ruapehu, Ngaruhoe, and Tongariro herds were also reported in what is now Tongariro National Park. And so herds of feral horses in the central North Island became ubiquitous by the beginning of the 20th century. From the Paeroa Ranges in the north near the southern bay of the Hauraki Gulf and Coromandel Peninsular to Taihape in the south herds were numerous and some herds grew to number in their thousands. Harvey Morrow reported horses and horse capture as common in 1906 in the back-country around Te Puke, and Te Teko and around Mt Edgecumbe, in northern and southern Bay of Plenty, respectively, and also to the south around Galatea. There were particularly large herds around Te Waotu (near Tokoroa), Atiamuri, and Mokai in the 1920s. The area was negotiated via horse and foot tracks but is now dissected by New Zealand’s State Highway 1 between its capital city, Wellington in the south, and its largest city, Auckland in the North. Herds of size were still present on the plains around Taupo and Valleys northeast of Taihape after the second World War (1947) – hard to imagine given the intensity of agriculture in those landscapes today. So large did some herds become, that they inevitably come into conflict with the aspirations of farmers to develop land. Large numbers were sometimes shot to liberate grazing for sheep and cattle – reminiscent of the longstanding and ongoing conflict between ranchers and wild horses in the USA. Morrow reports 4000 horses being shot for bounties from around Tokoroa. And so, beginning with Harvey Morrow’s accounts, we might beginning building a map of feral, free-roaming horses in New Zealand to furnish our interest in the history and geography of horses. I have begun with the map displayed here and would welcome any other contributions to it. If you have oral or written histories about wild horses in New Zeland you can send me the years and places for adding to the map to my e-mail address: wayne.linklater@vuw.ac.nz.